Juventus secured a record eighth Suppercoppa Italiana title after narrowly beating Milan 1-0 at the King Abdullah Sports City​. 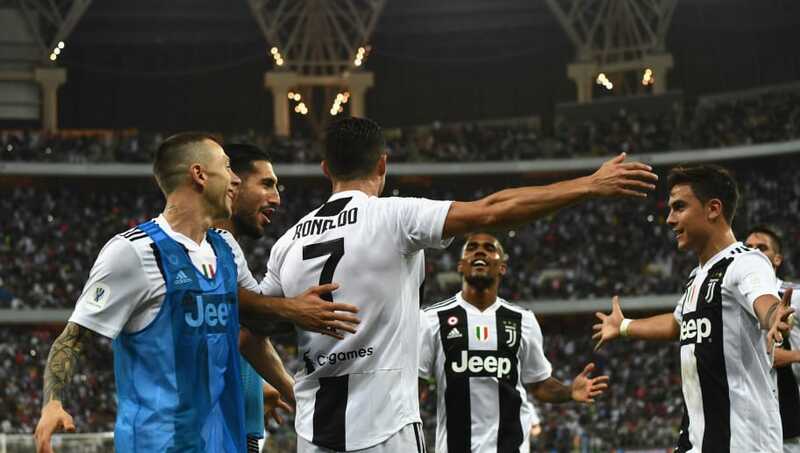 Cristiano Ronaldo latched onto Miralem Pjanić's cross to head home, what proved to be the decisive winner in the 61st minute for the Bianconeri, before the Rossoneri were reduced to ten-men after Franck Kessié had a booking overturned for a red card by VAR, for a high challenge on substitute Emre Can in the 74th minute. After starting on the back-foot, the ​Bianconeri composed themselves and began to shift the ball out wide, with João Cancelo and ​Douglas Costa providing a threat on the right flank, as both players saw efforts flash inches wide of the far post. The latter was central to everything Juve were creating and he proved to be a real handful for the Milan defence in the first half. His precise pass breached the Rossoneri defence and found Blaise Matuidi, whose strike was chalked-off for offside. However, it was Pjanić, who provided the breakthrough for ​Ronaldo, who timed his run to perfection and headed home from a pin-point cross by the Bosnian. The game, as a contest, then came to an end after the dismissal of Kessié and subsequently the Turin outfit went in search of a decisive second, but it ultimately didn't matter, as they held on for the victory. Starting XI: Szczęsny (5); Cancelo (6), Bonucci (6), Chiellini (6), ​Sandro (5); Bentancur (5), Pjanić (6), Matuidi (6); Costa (7*), ​Dybala (5), Ronaldo (7). Substitutes: Khedira (N/A), ​Can (5); Bernardeschi (N/A). STAR MAN - Ronaldo may have got the goal, but Costa was the one that stood out for La Vecchia Signora. He was involved in everything positive, his side had created. He cut-inside and caused havoc for the Milan defence all night long, providing a handful of good opportunities for his teammates, with Matuidi denied by the flag, and Ronaldo volleying over the bar. He also came within inches of finding the net, himself. WORST PLAYER - Alex Sandro was considerably below his usual best. He lacked the quality from out wide, with many of his deliveries failing to beat the first man and the ones which did, failing to find his teammates. The ​Rossoneri initially started on the offence and took the game to Juve in the first ten minutes, but despite getting into promising positions, the final pass had let them down on a few occasions. Il Diavolo looked a threat from set-pieces and a couple of dangerous deliveries from corners were causing Wojciech Szczęsny a few nervy moments, but they were unable to capitalise, although the keeper was well-beaten as the Casciavìt rattled the bar through Patrick Cutrone, within minutes of the second period. However, having fallen behind, Gennaro Gattuso's men were chasing the game and matters got worse when Kessié was dismissed for a high challenge on substitute Can, which ultimately ended any hope for Milan. Starting XI: Donnarumma (6); Calabria (5), Zapata (6), Romagnoli (6), Rodríguez (5); Kessié (5), Bakayoko (5), Paquetá (6); Castillejo (5), Cutrone (6), Çalhanoğlu (6). Substitutes: Conti (N/A), Borini (5), Higuaín (5). STAR MAN - Lucas Paquetá was impressive on his second competitive start for the side. He showed some nice touches in midfield, managed to get the better of a few players and made some good passes in key areas of the field to initiate chances for Il Diavolo. Unfortunately for him, his side didn't have as much of an impact as they did in the first half and as a result, he became ineffective and was subsequently replaced after conceding the opener. WORST PLAYER - Samu Castillejo didn't have much of an impact in the game. He received the ball in good positions, but wasn't able to make the killer pass to get his side in behind the Juve defence or provide the cutting edge in the final third. Serie A leaders Juventus return to league action on Monday and host bottom side Chievo, who have won just once in the league all season. Meanwhile, Milan visit the Marassi to face Genoa, who sit 14th. The Rossoneri sit fifth and are hoping to extend their unbeaten run in the league to three matches.